There will be two Basilica Farm & Flea markets this year -- in April and November. The schedule is out for the new season at Basilica Hudson. The converted factory space near the train station in Hudson is again hosting a wide range of events: performances, talks, screenings, markets. And the popular Basilica Soundscape festival returns in September. A compressed version of the schedule is after the jump. For full descriptions see the Basilica Hudson website. The celebrated choreographer talking about her career. Free and open to the public. "An immersive event and all-encompassing experience, 24-HOUR DRONE features musicians and sound artists experimenting within the spectrum of drone -- sustained tones shaped by voice or instrumentation." Tickets on sale now. 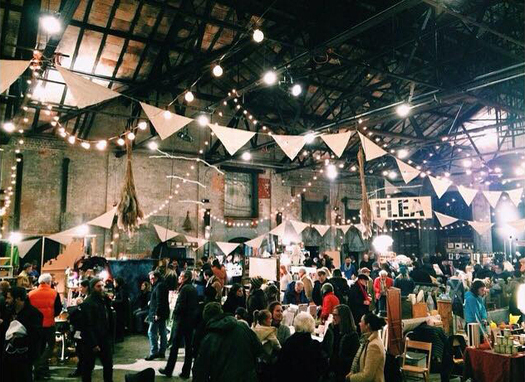 "Basilica Farm & Flea Spring Market will be taking over Ramp Fest weekend. After five amazing years we are honored to have a been part of putting Hudson on the map as a flourishing culinary destination, and we are excited to continue our collaboration with Ramp Fest's founders, Swoon Kitchenbar. Swoon will create a pop-up restaurant, complete with a bar and ramp-infused menu items for all attendees to enjoy." "Featuring hard cider producers and cheese makers from across the Hudson Valley. " "Cloaked by night and surrounded by colorful explosions, Basilica's (FREAK) FLAG DAY acts as freakier counterpart to the city's festivities, featuring performances and dancing into the wee hours." "The night of activities features a marketplace of food makers plus a roster of readings, discussions and demonstrations." "Basilica Scope is a weekend-long event devoted to film..."
"Basilica SoundScape features some of the most innovative and genre-pushing artists working today, drawing unconventional connections and collaborations across disciplines." "Basilica Hudson's bi-annual program celebrating pioneering artists across a range of disciplines, and including a benefit performance." "The marketplace features a diverse group of local vendors selling their wares alongside locally-sourced, farm-fresh foods." "Basilica Hudson's weekly screening series is an opportunity to discover a world of moving images outside the mainstream." "One-off concert series featuring unconventional voices from emerging and established musical artists." We went to Basilica Hudson last year some time in November only to find hundreds of people lining up outside in the cold, wet and windy weather to pay $5 admission fee. Can't imagine what was happening inside. Also, there was mud everywhere in the parking area. So we just got our boots dirty, shivered a bit and drove home. This was the worst experience at the event advertised at AOA this season. The best one? Fiber Festival at The Big E in Springfield back in October. We had tons of fun: hubby tried pretty much every spin wheel and tapestry machine available and I loaded up on yarn. Also, we saw sheep shearing.